Virtually all of the participating organizations have a website, and 97% have organizational profiles on various social media sites. This section examines how arts organizations manage their internet properties, and the platforms in which they participate. Section four examines social media use in detail. Providing rich information about an arts organization’s projects, events, history, and staff is easily facilitated through websites, but all websites need frequent content updates, current information, and solid performance in order to be effective. How are arts organizations managing this task? For 68% of the organizations in this survey, paid staff members (either full time or part time) are maintaining the website, while 23% rely on paid contractors, and 9% depend on volunteer help. More specifically, the survey asked whether there were staff members dedicated to website maintenance and development. 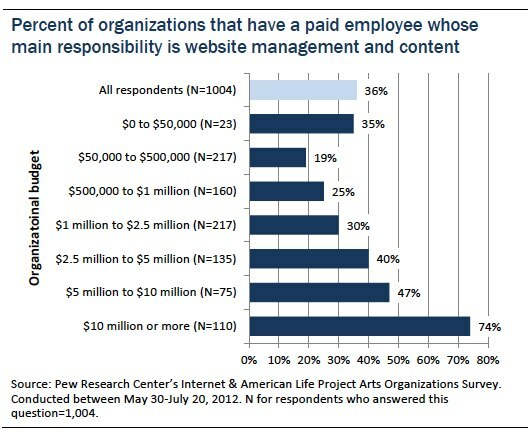 Only 36% of arts organizations have a staff member whose primary responsibility is website management. Organizational budgets seem to affect this number. Forty-four percent of arts organizations in the sample with annual budgets of $1 million or more have staff dedicated to website management. Only among the largest organizations — those with budgets of $10 million or more — do a majority report devoting a specific staff member to these tasks. The survey asked arts organizations to list the ways that they are using their own websites — and other sites — to fulfill their mission. The question included 18 different activities, and organizations could report as many activities as applied. Content creation, sharing and comments: The most common activities relate to posting and sharing content: 94% of these arts organizations use their website to post photos, 81% are posting or streaming video, and 57% are streaming audio. 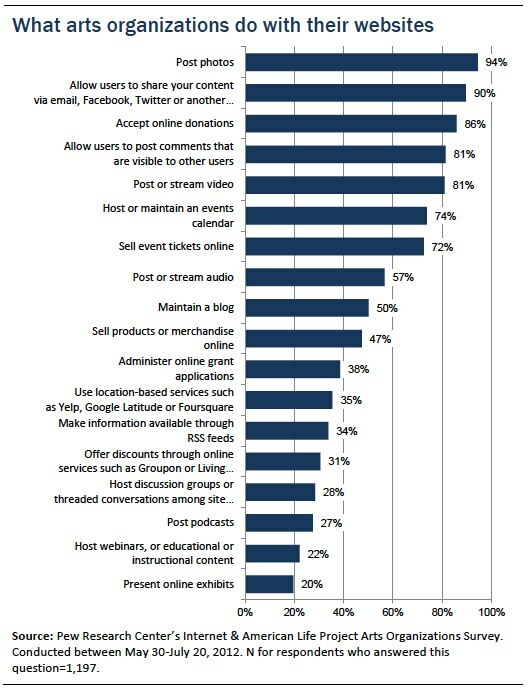 In addition, 50% of these arts organizations say that they maintain a blog. They are also facilitating content sharing and communication with patrons: 90% allow users to share the organization’s content via email, Facebook, Twitter, or another social media platform, and 81% allow users to post public comments on their blog or website. Event promotion and management: The other major category of activity involves event promotion and management: 74% of the organizations surveyed host or maintain an online calendar, and 72% are selling tickets online. Other activities: Lower on the list are activities that only apply to a certain type of arts nonprofit. For instance, 38% of organizations are using their website to administer online grant applications, but 16% say that this activity is not applicable to their work. Asked if their organization currently uses mobile and tablet-based applications — or apps — to deliver information or services, 24% of survey respondents say they use apps to provide content to the public. Fewer use apps to facilitate organizational work, sell tickets or merchandise, or to train their staff. In a separate question, 5% of the surveyed organizations report that they accept donations or gifts via SMS or text messages. The chart above suggests that only a handful of arts organizations have developed apps to serve their mission. This is likely because of arts organizations’ limited budgets, a point underscored by many survey respondents in open-ended questions. These organizations often struggle to find funds to support basic internet and web platforms, and the cost of mobile app development would present a further challenge. Related is the reticence of many arts organizations to invest in cutting-edge technology solutions, some of which will not last or be useable by many of their patrons who are not early tech adopters. [We have a] password protected portion of website for board members. Minutes, reports, agendas are posted to this site so that board members can read in advance of meetings. We use Dropbox to keep our prop lists up to date so that the stage management team can change the prop lists in rehearsal and the prop coordinator can access it and know it is the most up to date version of the list. We use Google Apps to make online collaboration among staff and board easier, thanks to a Google Grant we make use of $10k/month in free Google Adwords, we implemented a new browser-based donor management system, and use a Google Site to track all grant applications and status. We also accept donations on the fly at events etc., through use of the iPhone-friendly Square App. We are a 100% virtual organization — every employee telecommutes from their home, negating many expenses traditionally incurred by having office space. We are currently participating in “online booking” for dance rehearsal space rentals through NYC Performing Arts Spaces, allowing artists to look for available space and book space online. We have an online networking tool that allows literary artists and aspiring literary artists to connect with each other in search of services (editor, agent, manuscript help, copyeditor etc.). We invite professional writers to have a hand in social media curation, such as taking over our Tumblr feed for a period of time. Allow site users to curate and publicly share their favorite online content. We host two open calls for exhibition proposals annually and all jurying is done online. Approximately 100 jurors read the 500 word proposals online and cast their votes using a special web portal that we’ve designed. We market on local apps on phones that identify our theater as something to do when people enter a certain neighborhood. Our agency also hosts a great, free online arts and cultural events calendar [that] showcases the arts across the state. We have even partnered with convention and visitors bureaus from three major cities in the state to help support and finance this online calendar, which is very popular. We’re implementing mobile ticket this year and eliminating traditional paper-based tickets. Older patrons not comfortable with mobile technologies are still able to just use will-call services at events. We allow Select Your Own Seat on our website, with seat maps plus photos showing views from those approximate locations. Festival schedule is interactive and customizable — user can create his/her own schedule and then share it. We offer cell phone audio tours. These tours have been a tremendous way to reach out to our constituency with both historical audio that has been digitized, and new content that has been recorded and transmitted via MP3. Additionally, we are in the process of expanding our audio tours to include Smart Phone tag access for additional information dissemination. We also have a touch screen kiosk that has been an invaluable tool in assisting our guests in the process of interacting with the both literary and visual arts, our history, and our permanent collection in an intimate, albeit technologically advanced manner. The kiosk program is also available off-site via the web. The dual-action nature of our new media resources (on-sight and off-sight) has given us powerful tools for reaching many more constituents. Specific concerts that have real-time program notes that include history, composers and other interesting information. Audience members sit in a specific section of the auditorium and can connect to a secure site where the notes are distributed and choreographed to the music playing – live in the theatre. We use Skype for filmmaker Q&A’s following screenings. It allows our audiences to talk directly to the artists but the artist can call in from anywhere in the world. It’s wonderful, it still feels very personal despite the fact that the artist is miles away. We accept questions for our artists via email and Twitter and then tweet out our Talk-Back Q&A. In addition to posting audio clips on our web site’s show pages, we also publish playlists for various music series on iTunes. We have a video blog called the Musical Theatre Factory where our artistic director posts 1 – 3 vlogs a week. We also have an in-depth show archive so that folks can go back and look up everything related to a show (production photos, sizzle reels, casting, reviews). Images of all 12,000 objects in our collection are available on our website through our Online Collection. Some objects include scholarly essays. Information for educators is available through our Online Curriculum. Our Pinterest page, which we update using images from the Online Collection, is gaining in popularity. We are developing our searchable, on-line Timeline of past programming (exhibitions, publications, concerts, performances, readings, artists’ talks, etc.) going back nearly 38 years, and continually augmenting the text-based content and scanned, downloadable publications with more and more visual content: scanned and digitized analog slides from pre-digital-era gallery exhibitions, video & audio clips, etc. This has already served as a valuable resource for research for art historians, curators, journalists, artists, arts educators, and students. We have begun to use Google Hangouts On Air broadcasts for sharing our Institute training both globally and locally free. This next week we will be attempting a simultaneous drumming class in Philadelphia and the Philippines. We are currently creating a 3D virtual exhibition based on a museum exhibition. When fully developed, the virtual exhibit will extend the audience for the exhibit and it will serve as a pre and post visit learning opportunity for school groups. We just recently began organizing walking tours of our public art projects through Pinterest. Our center school’s music program for children with disabilities between the ages of 3 and 22 uses Skype as a virtual classroom in which we are linked with music performance, instruction and cooperative grant writing with over 20 university music ed programs and organizations for children with similar disabilities around the world. During the past four years we were able to use the internet to elevate the voices of those most affected by the criminal justice system – prisoners, corrections officers, their families and loved ones, and the communities where prisons are sited. Our website allowed us to represent the culture of mass incarceration in new and incisive ways, such as by establishing an online venue for the creation and exchange of prison poetry, a suppressed genre that should contribute to our nation’s understanding of itself. We created Facebook profiles for the two main characters in As You Like It that toured to high schools. They told the story of the play through status updates in modern language, and we invited students and teachers to friend them and interact with them. For the past several years, we have hosted an online fundraiser – the Clarion Write-a-Thon. The Write-a-Thon is like a Walk-a-Thon, but instead of pledges per mile walked, we have writers getting pledges per word, chapter, or story written. The web site we’ve developed for the fundraiser allows each writer to have his or her own editable page with stated writing goals, to join an online discussion group with other writers and a Clarion writing mentor, to post to a “team blog,” and of course, it enables sponsors to support individual writers through online pledges and donations. It’s been very successful from both fundraising and support for writers’ standpoints. The responses to this open-ended question point to the seemingly endless possibilities the internet and digital technologies represent for the arts, and the novel ways organizations are already using these tools to do everything from increasing workplace efficiency to deepening and enriching audience experience.